Embodying a powerful representation of life, the Monarch stands for hope and change. From caterpillar to the majestic King of the butterfly world, its transformation is a marvel in the natural world. Miracles like this are happening all around you. Slow down to appreciate what Mother Earth has to offer and you'll experience a newfound connection to nature. Wonder surrounds you. Of the 2,457 Monarch Butterflies I have raised and released in my garden since 2015, here are just a few photographs of the Monarchs. 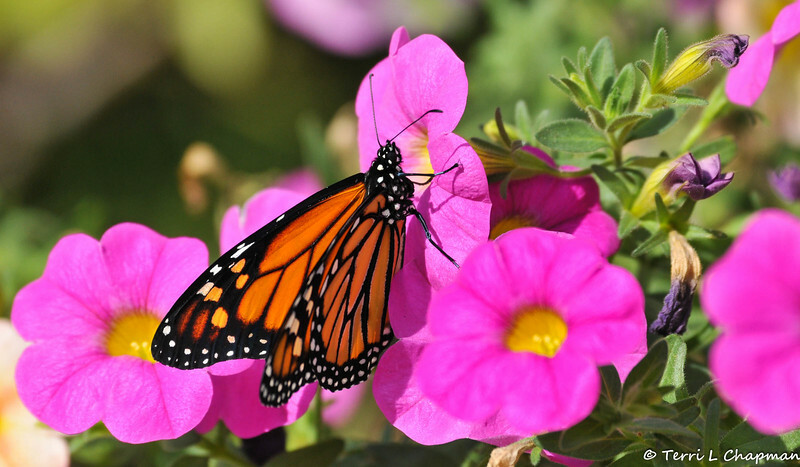 A male Monarch Butterfly born January 17, 2016 and resting on a Petunia bloom before he took his first flight. This Monarch was the 1,112th butterfly released in my garden.